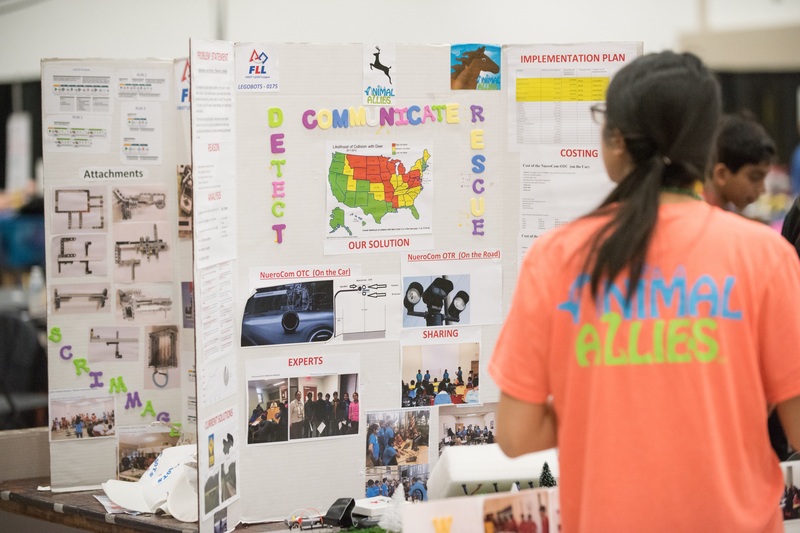 More than 500 kids, ages 9-14, on 72 teams gathered at UMBC on Saturday, February 25 to participate in the Maryland State FIRST LEGO League Championship tournament, completing a set of challenges designed to showcase their innovation and creativity. The event also drew hundreds of spectators and volunteers, including UMBC faculty, staff, and students, particularly from the mechanical engineering department, Center for Women in Technology, and Meyerhoff Scholars Program. A poster on display at the tournament. During the morning portion of the tournament, the teams presented solutions that they began working on in August to the judges. Each team was tasked with developing an innovative solution related to the overarching tournament theme: animal allies. The teams also continued to modify and practice with their robots, in preparation for the championship’s signature event, held in the afternoon. Before long, the Robot Challenge matches were underway, with teams guiding their robots through a series of missions with different difficulty levels and point values. The White Tailed Paradox team from Chapelgate Christian Academy in Marriottsville, MD, took home the top prize at the championship and reflected, “Once you are a team, anything is possible if you work hard and believe in what you are doing.” The also shared how much they enjoyed the opportunity to meet teams from across Maryland—kids from different parts of the state who share their interest in robotics. Both of these values—believing in the power and tenacity of teamwork, and appreciating every chance to connect with like-minded friends of different backgrounds—are central to UMBC’s vision and reputation, and, organizers suggest, reflect what draws participants and spectators to the event at UMBC each year. A team demonstrating their project for a tournament judge. The White Tailed Paradox team will compete in the world championship in St. Louis next month, against teams from the United States, Canada, Europe, and Asia. 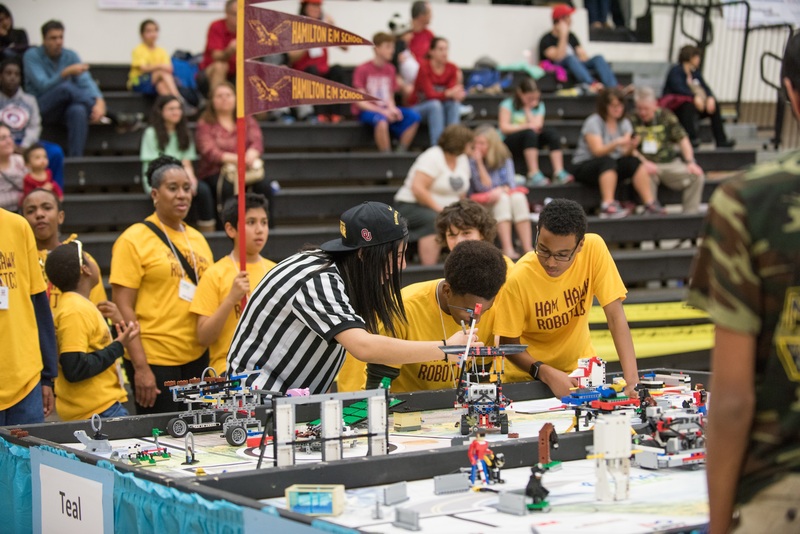 Northrop Grumman has sponsored the FIRST Lego League since 2007. Banner image: Participants working on their project during the tournament. All photos by Marlayna Demond ’11 for UMBC.